Think about how different makeup looked in the 1990s. Certainly the styles were very different (pencil-thin brows, body glitter, etc. ), but thinking back, the products themselves also looked like they were from another universe. Remember the glitter, bright colors, and over-the-top fonts that littered every label, from Lancôme Juicy Tubes to L.A. Looks Styling Gel? What about the inconceivably harsh formulas of Sea Breeze and Sun In? The '90s were a special time. If beauty formulas and packaging were that different 20 years ago, imagine how much they must have changed over the past century. What were the Juicy Tubes of 1925? Our curiosity peaked, so we went on a research bender to find the following makeup products, which date as far back as the 1800s. Curious to see what lipstick and mascara looked like 100 years ago? Keep scrolling to see 10 riveting images of vintage makeup products. This light, powdery blush formula was invented by Alexandre Napoléon Bourjois in the 1860s, and the product is made almost the exact same way today. Early on, the tins were cardboard and finished with galuchat to create the look of leather. How gorgeous is this hand-painted packaging? A hundred years ago, French beauty brand Molinard crafted its lipstick tubes out of wood. This bright cherry-red color was all the rage during the flapper era. In the 1920s and 1930s, blush (or "rouge" as it was called) came in these darling, gold-colored, refillable compacts, which contained puffs, not brushes. This stunning, saturated shade is called Framboise, or "raspberry" in French. 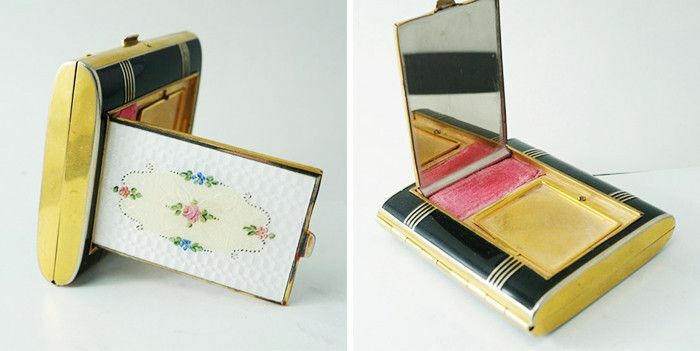 Eighty years ago, this amazing enamel compact contained powder, blush, and a cigarette holder, bringing new meaning to the phrase "multitasking makeup." "Cake" mascara was the first-ever mascara formula that women used, long before the tubed liquids we know now. The solid product was painted on lashes and brows with a tiny brush, creating the ultra-pigmented, clump-free look we find on Marilyn Monroe and other film stars from the era. Cake mascaras are still available today—check out this vintage-inspired pick from Bésame Cosmetics ($25). Why were powder compacts so much more intricate 80 years ago? This painfully pretty silver and enamel case contains a powder puff so much fancier than the no-frills sponges we see today. Can you imagine displaying your favorite lipstick tubes in such luxury? This ornate gold case from midcentury New York looks like something out of Versailles. These intricate brass bottles, called surmadani, have been used in the Middle East for centuries. Traditionally, they are meant to hold black kohl eye makeup, which some cultures believe protects children from the evil eye. If you're old enough, these geometric blue Dior lipsticks will remind you of your childhood (or teen years, or adulthood). Who remembers that distinctive, powdery scent? Want more throwback beauty? Don't miss these bizarre images of vintage beauty devices.